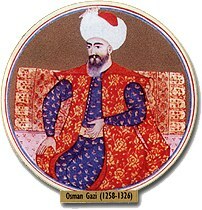 1324-1360 , Orhan I Gazi. Crosses into Balkans in 1345 as ally of Byzantine Emperor, John Cantacuzenus, against Serbs; marries his daughter, Theodora; 1353, John C. Again calls in Orhan and this time Ottomans stay; set up base at Gallipoli; JohnC. seeks help from Bulgars and Serbs against Ottomans but they refuse; John C. abdicates (1354 ) and is succeeded by John Palaeologus. Ottoman capital at Bursa. 1350-1389, Murat I. Successful campaign in Thrace obliges John V, Palaelogus, to recognize capture of Philippopolis and Adrianople (Edirne) and to agree to become Ottoman vassal (1363); Murat moves Ottoman capital to Edirne in 1366; origins of Janissary Corps and the devshirme probably date to Murats reign. King Sisman of Bulgaria defeated, accepts vassal status in 1379; Serbs defeated and dynasty of Stephen Dusban ended; John V appeals to Christian Europe but gets no help; his vassaldom deepens, must render military service to sultan and give over his son as hostage far punctual performance of his obligations; Macedonia is conquered; completion of subjugation of Bulgaria and Serbia; Sofia falls in 1385; one last concerted effort by Balkan Slavs against Ottomans at Battle of Kossovo (1389) ends in complete Ottoman victory, but during the battle Sultan Murat assassinated by a Serb pretending to be a traitor, Milosh Obilic. Murats son, Bayezit, assumes command and immediately executes his brother to avoid possibility of a dynastic struggle. 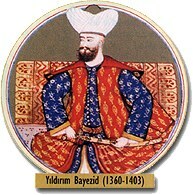 1389-1403, Bayezit I, Yildirim(The Thunderbolt). Bayezit takes the throne and finishes off the victory at Kossovo, captures and executes Lazar (last Serbian tsar) whose daughter, Despina, becomes a wife of the Ottoman sultan. 1393, Bulgarian dynasty is extinguished and Bulgarian patriarchate ended; Bulgarian lands are absorbed and Bulgarian church reduced to dependence on Greek patriarchate at Byzantium. 1394, Pope Boniface IX proclaims crusade at urging of King Sigismund of Hungary; led by Sigismund, Catholic forces are defeated by Ottomans in Battle of Nikopolis (1396). With no effective resistance remaining, Ottomans conquer most of Greece and southern Albania. The Balkans, except for the immediate areas around Constantinople, Athens, and Salonika and the extreme southern Morea are ruled by Bayezit from his capital at Edirne. Administrative structure strengthened and centralized through elaboration of tahrir-defter (cadastral survey-record books) system based on military fiefs (timars). Expansion of Ottoman rule eastward over Anatolian principalities through combination of diplomacy, dynastic marriages, and military expeditions brings Ottomans into conflict with Timur Leak (Tamerlane) who invades Anatolia and challenges Bayezit at battle of Ankara in 1402. Bayezit is defeated, captured, dies in captivity in 1403. 1403-1413, dynastic struggle; civil war among Bayezits sons; Suleyman and Musa eventually killed; Mehmet emerges as victor; Christians fail to take advantage of this opportunity to throw off Ottoman rule. 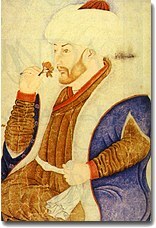 1413-1421, Mehmet I, the Restorer. Devotes his energy to reunification of Ottoman lands and reconsolidation of sultans authority; European territories kept fairly intact and most Anatolian provinces recovered; avoiding unnecessary foreign conflicts, Mehmet provides a breathing period in which to heal wounds and reintegrate previous conquests. Albania and Epirus. War with Hungary provokes another crusade against Ottomans; coalition of Hungary, Poland, Bosnia, Wallachia, and Serbia led by the Hungarian, John Hunyadi, wins a victory; Murat signs ten-year truce at Szegedin (1444 ), voluntarily abdicates in favor of his 14-year-old son, Mehmet, and retires to life of religious study and contemplation. Hungarians, encouraged by the Papacy, break truce and renew crusade; Murat comes out of seclusion, resumes throne, and defeats crusaders at Varna. Four years later (1448 ), in second Battle of Kossovo, Murat defeats Hunyadi who has again invaded Serbia, ending any serious threat from Hungary; Albania, under Scanderbeg, continues to resist. The essentially conservative policy of Murats reign reflects the influence of the Jandarli viziers. 1451 - 1481, Mehmet II, Fatih (The Conqueror). Fall of Constantinople in 1453 only the beginning of an aggressive policy of conquest; capital moved from Edirne to Istanbul; shift of political power from provincial notables and feudal lords to the sultans slaves (kapikullari); the Palace School and the organization of religious education through the medrese system; elaborate court and expanded bureaucracy; the imperial tradition is firmly established and the classical age of the Ottoman Empire has begun. War with Serbia, aided by Hungary; Hunyadi and the Serbian king, Brankovich, both die in 1457; family quarrels over succession; one claimant appeals to Pope for aid, offering to make Serbia a papal dependency; people declare they prefer rule of Muslim Sultan to Catholic Pope and open their cities to Mehmet; Serbian independence ends in 1459. Ottomans invade Bosnia in 1453; Bosnian nobles refuse to support Catholic king, Stephen, and hand over fortresses to Mehmet, many converting to Islam at the same time, thus beginning the process which ultimately sees most Bosnians become Muslims. Herzegovina is occupied a year or so later, and Albania is absorbed following Skanderbegs death in 1467. War with Venice ends in 1479 with the Venetians giving up Scutari (Uskudar) and other stations on the coast and agreeing to pay a tribute for permission to trade in the Black Sea. In 1480, an Ottoman force occupies Otranto in southern Italy, causing panic throughout the Catholic Europe. Mehmet besieges Rhodes (1480-81), held by the Knights of St. John, a relic of the Crusades, but dies before the siege is successful.